Blessed be the fruit! We're glad you've arrived. If you're looking to carry Gilead forward with the proud mantel of Handmaid, congratulations! Our licensed Handmaid's Tale costumes pay tribute to both Margaret Atwood's novel as well as Hulu's dramatic retelling. Try on this look for a costume party and you're sure to fall into character. And when you're ready to return to free society simply say, "Under his eye" and you'll escape from Gilead! When you're a Handmaid's Tale fan, it can be difficult to stop thinking about the world of Gilead. You might want to stop thinking about it. It's a cold, dark, quiet, and unbelievably frightening world. So yeah, it would be good to leave Gilead behind when the last episode of Handmaid's Tale behind. But the red robes and white bonnets still haunt Handmaid's Tale fans when we think about the small freedoms of our daily lives. If you can't quite shake the world the Margaret Atwood brought into existence then you might as well lean in. Step into the sensible shoes of the Handmaids and you'll feel closer than ever to characters like the tough and rebellious Offred and Ofsteven. In fact, you can really shake things up and get a group of ladies together for one of the eeriest group costumes that people have seen in a while. Speaking of group costumes, we here at Halloweencostumes.com have some serious dreams for these Handmaids Tale costumes. We'd love to see a group of Handmaids walking around the streets of New England. You could even delegate your most intimidating friend to be an aunt. 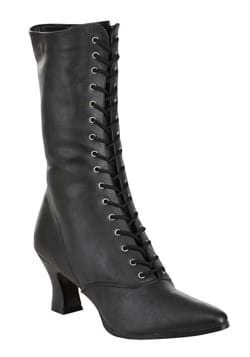 She could dress up in a brown dress, military style boots, and an extremely stern expression. If you don't get an award for best group costume for this amazing look, we don't know what would work! Now that we think of it, these red robes can be used for occasions other than Halloween as well. Do you want to make an impression at your next book club bash? This literary costume will mark you as a true-blue literature fan. You'll really earn some clout. This is one way to convince your group to go on a one year Margaret Atwood kick. You can start with the Year of the Flood, move on to the light-hearted Blind Assasin, gossip about The Robber Bride, and finish off with the crime drama Alias Grace. You see, Atwood has something for everybody! Okay, okay. Maybe we're getting away from ourselves. You don't have to stage a coup over your book club even if that would be best for everyone involved. All you need to do is have macabre fun wearing this ensemble. Put on your most pious (or your most secretly subversive) expression. The Handmaid's Tale costume is a great option for a maternity costume as well as a look for literature majors and people who want to stir up some serious discussions about basic rights and freedoms. 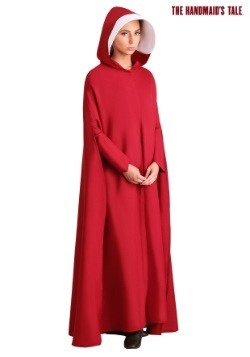 So whether you're planning on putting on the red robes of the Handmaid solo, you're getting together with friends to make this a group costume, or you're pairing with two friends in both green and brown dresses to represent the other women in Gilead, you're sure to make an impression in this ensemble. Just be sure you get your Gilead vocabulary right. That's "Blessed be the fruit" "Pleasant weather we're having" and "Under his eye". Say anything else and you never know who might overhear you in the authoritarian state of Gilead!